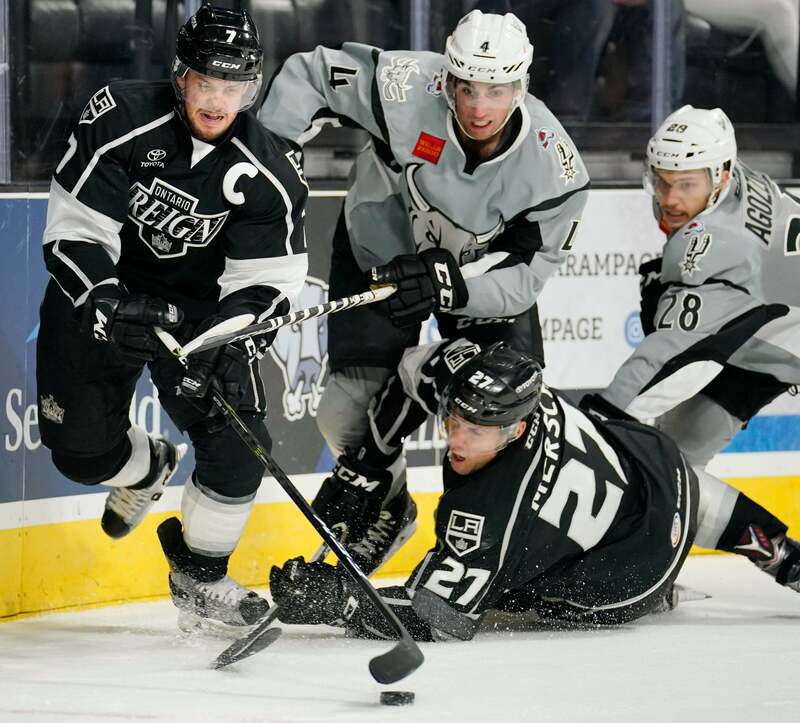 San Antonio, TX – The 2017-18 season is officially underway for the Ontario Reign and the team’s 10th Anniversary season, but the San Antonio Rampage spoiled the celebration with a 2-1 victory at AT&T Center Saturday night. The San Antonio Rampage dominated the first period with 12 shots on goal compared to the Reign’s four. Eventually, the Rampage broke through, taking a 1-0 lead at 10:48. The first goal of the game came at the stick of Samuel Blais, with assists from Rocco Grimaldi, and Andrew Agozzino. The Reign opened up the second period with a 5-on-3 power play after a pair of penalties by the Rampage’s Trent Vogelhuber and Gabriel Bourque to end the first. After not capitalizing on the outmatched manpower, the Reign quickly found themselves down 0-2. The Rampage’s second goal of the game was from Jordan Schmaltz and assisted by Gabriel Bourque, and Adam Musil at 2:17. The Reign, however, controled the puck and game tempo with 10 shots on goal while the Rampage had 11 of their own. The Reign’s first goal of the season came at 13:23 unassisted by Michael Mersch. Mersch caught San Antonio’s goalie Spencer Martin outside the net, and dumped the puck in off of his backside from below the goal line. The third period went scoreless for both teams. The Rampage outshot the Reign in a slow period. The Reign finished 0/3 on power play chances with San Antonio racking up a total of 11 PIM. The Reign’s solo penalty of the game was committed by Bokondji Imama for fighting at the 13:31 mark of the second periood. Ontario finished the contest with a total of 19 SOG, while San Antonio tallied 32 SOG.